Thu, Apr 18, 2019, 17:03:24 ---- The fact: 42.844.000 visitors done. 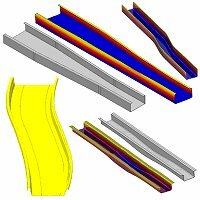 data M Sheet Metal Solutions GmbH is specialising in the sheet metal bending and roll forming industry, offering consulting services and software solutions including automotive. The software COPRA RF offers new technologies for almost all areas of roll forming which could up to now be realised with huge efforts so far. This includes the possibility to integrate drawing dies into a roll forming process, the automatic design of one or more cage tooling (lineal forming) in a tube welding line, new types of forming stands in the tube software package and a totally new way to design roll tooling. With the newest technology Flexible Roll Forming, data M has redefined the definition of Roll Forming. Manufacturing of non-uniform cross sections has become a reality. This technology has an advantage compared to Press Forming one mill can be used to manufacture various cross sections with single tooling and high accuracy. The picture shows examples of such kind of discontinuous cross sections as they are used in automotive application or for architectural purposes. data M offers the whole engineering services in order to introduce this new forming concept from case studies to the design and supply of required hardware components including CNC control and motor drives. Roll tool quality control involved in the roll forming. The time, effort and money saved with this high-end technology have been a big advantage for the future growth in the Industries. COPRA FEA RF (Finite Element Simulation of the Roll Forming process) helps to understand the roll form process, trace for occurring problems and do a target-oriented optimisation. The software for the non-linear, elasto plastic simulation of the roll forming process allows for the prediction of profile properties before the manufacturing process even starts. The software gives information like material thinning effects, twist or strip edge buckling. The user gets knowledge about any changes in material properties like work hardening and is therefore able to optimise his roll formed sections with regard to subsequent forming processes like bending or hydro forming. COPRA FEA RF is being used by aluminium- or steel producing companies, machine makers, custom roll forming companies, but also by end users, e.g. car manufacturers.